This handsome bungalow is one of the few brick bungalows constructed in Dean Park. 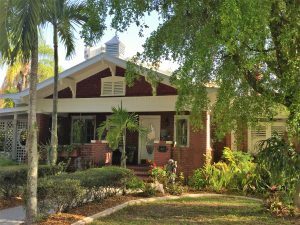 It also has many of the classic Craftsman features including the expansive front porch, exposed rafters, wide roof eaves. As often happened during the Florida real estate boom, the parcel changed owners several times before a house was built on the lot. In 1922, Dean Development Company sold the parcel to James F. Garner for $1,300, subject to a building restriction that a house costing at least $4,000 must be built there. In January 1924, Mr. Garner sold the parcel to Walter S. Turner, Jr.; in January 1925, Mr. Turner sold the parcel to E.P. Dobbs of Cobbs County, Georgia; and in March 1925, Mr. Dobbs sold the parcel to Kate H. Coffey. James W. Coffey a varied career. Born in Kentucky in 1858, Mr. Coffey and his wife, Kate, were both residents of Denver by 1910, when the census shows him to be a “household auctioneer.” By 1920, he was “manager of bakeries” in Jacksonville, Florida. Mr. Coffey first appears in the Fort Myers city directory in 1923, when he was owner of the Up-to-Date Bakery Company and the Up-to-Date Investment Company with offices on Cleveland Avenue. 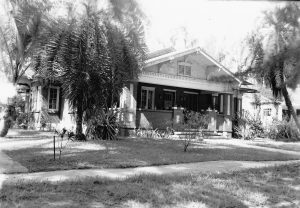 By 1925, Mr. Coffey was Secretary-Treasurer of Seminole Realty Company, Inc. and Mrs. Coffey was Vice President of the same firm. He was also a very active member of the Rotary Club in Fort Myers, and newspaper articles recount that he did everything from umpiring Rotary baseball games to singing “My Old Kentucky Home” at a Rotary meeting. Other address: 1133 Providence Street; Dean’s Subdivision, Block H, Lot 11.